This story originally appeared in the Jan. 23, 2017, issue of Sports Illustrated. Subscribe to the magazine here. The short ones, the pudgy ones, the ones who couldn’t drive or kick, pick or roll, rise or finish, those were the players Lonzo Ball wanted. You could take the five-star recruits with the superhuman wingspans and astronomic verticals, with the vision and knowledge and feel. But not the scrawny 16-year-old perched at the end of the bench, still waiting for that growth spurt, still working on that left hand. You had to leave him for Lonzo. Ball never fled to Southern California’s AAU powers or private schools. When top prospects asked to run with him, he usually demurred. He could dish to his dynamic younger brothers, LiAngelo and LaMelo, at the local high school and with the Big Ballers AAU program his dad established. But LaVar made sure the rosters weren’t stacked, for fear his point guard prodigy might ever be tempted to yield responsibility. Lonzo’s staggering success last season at Chino Hills—where he averaged a triple double for a high school phenomenon that went 35–0, scored 98 points per game, beat every opponent by double figures and sold out gyms in less than 10 minutes—posed a question that LaVar has pondered for some time: What if Zo ever did hook up with McDonald’s All-Americans, deadeye snipers and go-go drivers, a power forward who resembles a lottery pick and a center who fetches lobs at the square? What if he was flanked by hardened vets and springy teens who hail from basketball families as renowned as his, with a coach who feels his burdens and a fan base that shares his expectations? What in the Big Baller World would that look like? It is a blur, the 6' 6" Ball careening down the court, eyes fixed on a destination others can’t see. With one wrist flick he initiates a mesmerizing game of hot potato, inevitably culminating with another uncontested moonbeam. Here marks a return to college hoops the way Nolan Richardson and Jerry Tarkanian intended, before robotic point guards stood motionless atop the key staring at the sideline for further instructions, before Connecticut won a national championship game with 53 points. SI spent last week with No. 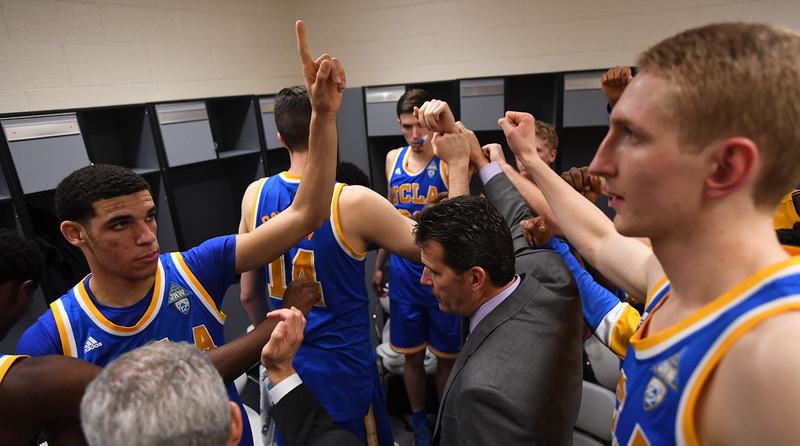 3 UCLA and its new souped-up scoring machine, a high-octane apparatus that regularly cracks triple digits, applauds 30-foot shots and encourages four-second possessions while rejecting stilted sets and ball screens. Film sessions are spliced with Warriors highlights, staff meetings include Sasquatch sightings, and a hard drive named Dirk may need more room. “Put on your seat belt,” coach Steve Alford instructs his assistants. The two Turkish students who live on the fifth floor of Rieber Vista, in a pod with five singles, express no interest in the three oversized freshmen who share their personal space. Either the Turks don’t know, or don’t care, that Ball dishes out 8.0 assists (second most in the nation), that 6' 10" power forward T.J. Leaf is UCLA’s second-leading scorer (16.8), that 6' 10" center Ike Anigbogu blocks shots and flushes lobs like DeAndre Jordan in training. What these young giants can’t do is hook up basic cable, which is fine when they’re playing PS4, but a crisis when college football’s national championship game comes on TV. The freshmen are inseparable. They live together. They eat together. They shop at the Beverly Center together. “Not the seventh floor,” Ball clarifies. “That’s Prada and Gucci and all the stuff we can’t afford.” In case they miss each other at night, Leaf decorated his single with a picture left by a fan at Oregon State. “It’s a drawing,” Leaf explains, “of Lonzo’s head in the sky.” The trio even took the same classes, marveling at the one professor who correctly pronounced Anigbogu’s name (EE-kay ah-nee-BOH-goo), until a controversial split this quarter. “Those two are doing African-American studies,” Anigbogu says. “I’m in econ.” Ball shoots him a glare. “Ike gets sick of us,” he says. Sitting on high-backed leather chairs, as Clemson shows signs of a comeback, the baby Bruins reveal the plots of the scripts they authored for screenwriting class. Leaf’s is a drama set in Austria about a love triangle in which one member is a German spy. Anigbogu’s, inspired by Alfred Hitchcock’s Psycho, is a thriller set in a mountain resort where two American students are mysteriously killed. “Mine is about high school,” Ball says, “a guy and a girl.” He coughs up no details. “Yeah, your girl,” Leaf says. Ball gazes blankly at the TV. “It snowed in Corona,” Anigbogu claims, between bites of Lamonica’s pepperoni. “The only way there was snow in Corona,” Ball protests, “is if you went up the mountain, got the snow and brought it back down.” Anigbogu scrolls fruitlessly through his Instagram account for evidence. The Bruins are 16–1. They lead the nation in offensive efficiency. They boast the highest effective field goal percentage since the stat was popularized 15 years ago. The freshmen are asked if they can imagine, three months from now, playing in a national championship game of their own. They look back at the TV. “Not yet,” Ball says. 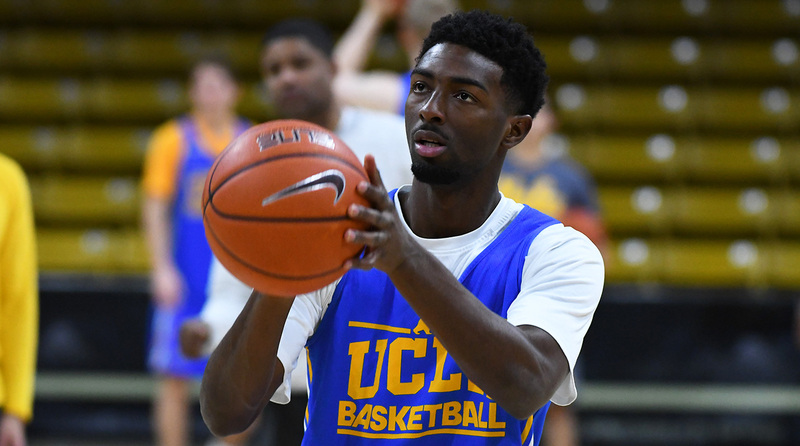 UCLA went 15–17 last season, finishing 73rd in adjusted tempo, and at the end Alford trashed the entire offense. “We ran the same pick-and-rolls as everybody else,” he says, “and I got so bored watching it.” He wanted to install a turbocharged motion attack, modeled after the Warriors and the Spurs, and conveniently he was getting a point guard uniquely qualified to direct it. Ball has been throwing alley-oops since he was six, sprinting up the hills near his home, joining YMCA games against adults. His father told him to play as fast as possible because more possessions meant more reps, and the only way to beat grown men was to outrun them. The Big Baller movement was born. The numbers reveal much more than that. Kory Barnett, UCLA’s director of player development, and Kory Alford, the video coordinator, keep all the data on an orange Lacie hard drive they nicknamed Dirk. They should probably call it Steph. They run by far the fewest pick-and-rolls in the Pac-12, 9.5 per game, but they are doing it the most efficiently. “Just like the Warriors,” Kory Alford says, calling up NBA stats on Synergy. Golden State finished 30th in pick-and-roll attempts last season but averaged the most points in those possessions. Hamilton sits under arched ceilings on the third floor of Royce Hall, waiting for his first European history class of the quarter. He watched a documentary the night before called Minimalism and is pondering ways to tidy up his life. That may be difficult. Hamilton shares a spotless garden apartment west of campus with teammates Welsh and Prince Ali that is decorated with a California flag, a poster of Michael Jordan at the 1987 dunk contest and little else. “Yeah, but there’s stuff in my refrigerator I don’t really need,” Hamilton says. He does keep a mini fridge in his bedroom. He leaves the big one for Welsh, a seven-footer who struggles to add weight, and he organizes it when the big man isn’t looking. He also remakes beds and refolds towels in hotels, a habit that confounds his road roommates. The professor begins. “The final exam will be March 23. If you can’t make it because you are going away on a ski vacation—or I don’t know what—that will be a big problem.” Hamilton jots the date in his notebook. March 23 is the first day of the Sweet 16. The 6' 3" senior marksman has scored 1,702 points at UCLA and endured almost as many tired Daddy’s Boy chants. He begs for some originality. “I think I’ve been through everything as a college player,” Bryce says. “Winning, losing, ups, downs, so much pressure. Handle the ball, run off screens, get open looks, worry about other guys. There were times I couldn’t focus on one thing. My mind was all over the place. And no matter what I did, people still thought I only played because my dad was the coach.” It is Wednesday night, and the Bruins are riding on the Northwest Parkway from Denver International Airport to the Renaissance in Boulder. Bryce’s hushed voice is the only sound on the bus. Late Thursday night, after pasta and ice cream at the Renaissance, he reads them all. Bryce has just scored a career-high 37 points at Colorado—”Get 40!” Lonzo shouted in the closing minutes—and UCLA has tied a school-record with 19 three-pointers en route to a 104–89 win. Bryce and Hamilton combined for 13 of the treys, a reminder that the Bruins’ seniors are almost as crucial as the freshmen, because defenders can’t help off either one without risking an aerial assault. 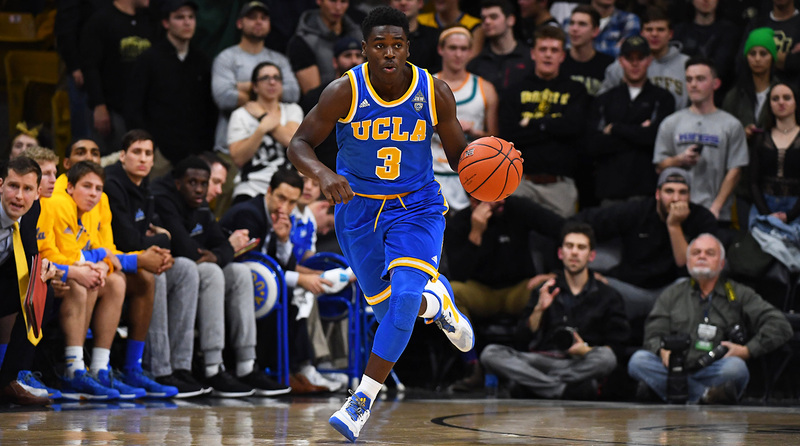 Bryce and Hamilton have sacrificed, though not as much as sophomore spark plug Aaron Holiday, perhaps the best player in the country who isn’t starting. Lying on his double bed in room 524 at the Salt Lake City Center Marriott on Friday afternoon, watching a replay of the UCLA gymnastics meet against Arkansas, Holiday checks to see if his older brothers are playing. Jrue, the starting point guard for the Pelicans, and Justin, a backup shooting guard for the Knicks, both have nights off. The Holidays are hoops royalty in Los Angeles, but so are the Hamiltons. Isaac has an older brother, Jordan, who played in the NBA, and a younger one, Daniel, who is in the D-League. Leaf, like Ball, was coached by his father. 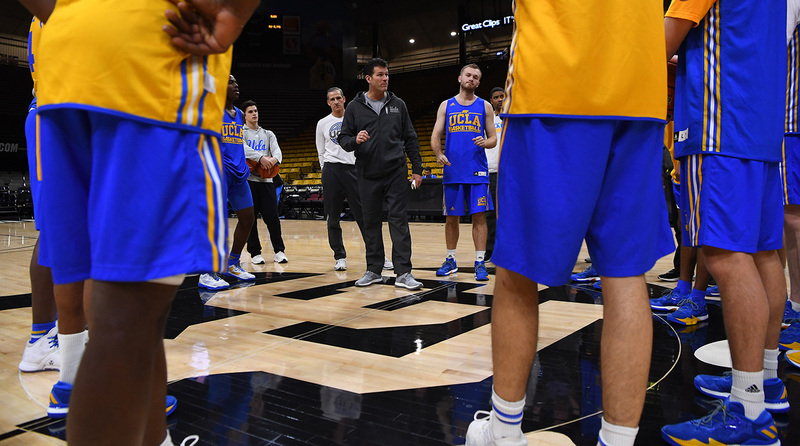 Even coach Alford still calls his dad, Sam, to talk about strategy before and after every game. When Alford moved the 6' 1" Holiday to a sixth man role, after starting at the point last season, the coaching staff braced for some blowback. But Holiday was buoyed by his brothers, who suggested that experience off the bench would help him as a pro. He was also counseled by another jitterbug guard, who has seen up close the damage that dual ballhandlers can wreak. He is watching the Bruins perform a rollicking five-on-five drill, implemented by assistant coach Ed Schilling, called Quick Strike. The sides scrimmage with a 15-second shot clock, but when they make a basket, the number of points they receive corresponds to the number of seconds on the shot clock. So if they score with 11 seconds left, they are awarded 11 points. Every possession is a race. Edney is 43, but he checks in at 167 pounds—two over his playing weight. In his presence, it is still a spring day in Boise, and the clock reads 4.8. Ball was not alive for Edney’s full-court dash in the second round of the 1995 NCAA tournament against Missouri, but early this season he put 4.8 seconds on the clock at Pauley and took off. He made one cut, same as Edney, and beat the buzzer, same as Edney. He sprinted triumphantly to the locker room. The amateur figure skaters, wiping out on the rink below the second-floor window, provide comic relief as the Bruins convene in a Marriott ballroom for film study Friday night. UCLA’s downfall is defense, specifically against the pick-and-roll, and maneuvering around screens is a constant source of concern. “We’ve got to get pissy when these teams screen us,” Alford says. “Bigs, you’ve got to prepare for a fight. Guards, you’ve got to take the screens personal.” The Bruins review which Utah shooters they have to chase over screens (“the Currys,” Alford calls them) and which they can sag under (“the Rondos.”) They spend about 90% of the meeting on pick-and-roll defense, but still the Utes shred them with 50 points in the paint Saturday afternoon. Throughout the second half, UCLA coaches discuss the right time to rest Ball, who has little experience at altitude. But the game is tight. They can’t afford to sit him. Lonzo satisfies all of LaVar’s requests at Utah, scoring 17 points with eight assists and five steals in 40 minutes. But the box score does not do him justice. While the Utes keep halting the tempo, Zo keeps revving it back up, driving and kicking before Utah can set its D. He finds Bryce and Holiday for the game’s critical buckets, both threes, and with 12 seconds left Utah calls timeout trailing by a point. “We need another big,” Ball tells Alford, and the coach summons Welsh to flank Leaf on the front line. LaVar is as outspoken as Lonzo is reserved, making clear his son will be in the NBA pretty soon, no surprise given how many general managers project him as a top three draft pick. Although Lonzo’s shooting motion is unorthodox—he raises the ball from his left hip to his right side—it’s plenty effective. 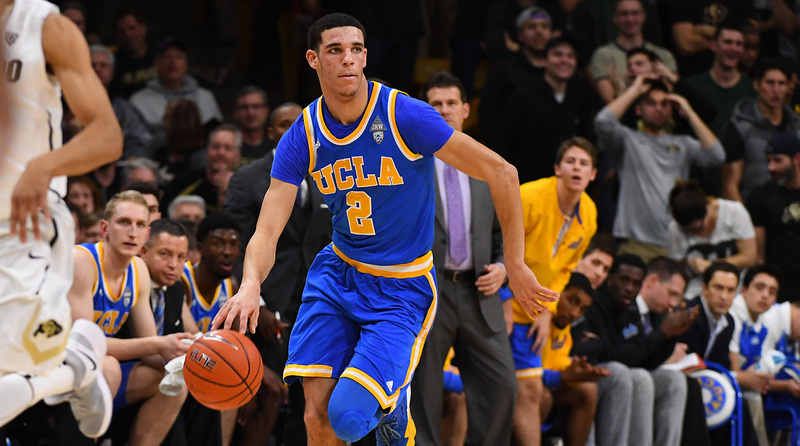 Without their precocious ringleader, the Bruins may slow a step, but Alford hopes not. UCLA has inked the No. 2–rated recruiting class, including sharpshooter LiAngelo Ball, and coaches believe their breakneck style will appeal to more So Cal families who favor Showtime. College hoops is forever consumed by the future, but in this instance, it’s worth curbing the pace and admiring the view: a basketball blue blood returned to prominence, led by freshmen and seniors, a legend on the sideline and a phenom at the point.